One of the biggest complaints I hear from people on the verge of giving up on their natural hair is maintenance. And maintenance generally refers more to detangling than actual styling and upkeep. Detangling is simply separating the strands of your hair to remove tangles and shed hairs that can cause matting, knots, and breakage. 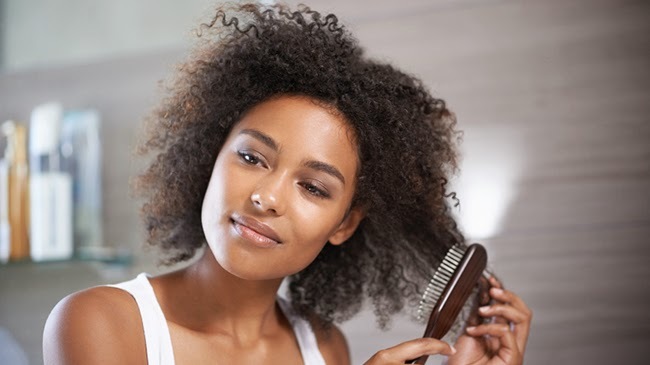 Proper detangling is key to overall hair health, so take a look at the tips below to cut down on your detangling time and to make it more efficient. When the hair is wet and full of conditioner, it is in the ideal state for detangling. The water and conditioner provides enough slip to make it super easy for your fingers or styling tool to glide through the hair. Although the strands are most fragile when wet, the hair is flexible, elastic, and loose enough in this state to withstand a comb when used carefully with conditioner. There are a few different styling tools to use for detangling including a wide tooth comb, paddle or vent (Denman) brush, and my personal favorite, your five fingers! Combs with tiny teeth, boar bristle brushes, brushes with balls at the end of the bristles should be avoided. Finger detangling is using your fingers like a comb. When finger detangling, you should be able to gently undo minor knots and tangles. You can use this as your only detangling tool or use it before using a brush or a comb. Detangling your hair in sections simplifies this portion of your hair care regimen. It allows you to focusing on one section at a time and ensures that you don’t neglect any strands of hair. Most people separate their hair in 4-8 sections. You can use plastic hair clamps or duck bill clips to secure your sections. The proper way to detangle your hair is from ends to root. Hold the ends of your hair with one hand and detangle with the other hand. Once the very end is detangled, move your hand up one inch and begin detangling again. Continue until you’ve reach the root of your hair. I can usually detangle my hair in about 10-15 minutes in the shower just using my fingers. I stand in the shower, allowing the water to run down my hair for at least 1 minute. This process naturally loosen many tangles. Then, I apply conditioner and begin to detangle hair from ends to root in sections. When I’m done with conditioning, I also detangle during the styling portion of my hair care regimen. Detangling is great for distributing product throughout the hair. Do you have a different method of detangling? Share your thoughts with me. Posted on April 7, 2015, in Natural Hair and tagged detangle, Natural Hair. Bookmark the permalink. Leave a comment.